The Heliopan 28mm KB-3 (82C) Filter is a color conversion filter that helps to slightly increase color temperatures and provide a cooling effect. The 82C removes the red light cast that commonly occurs when photographing with 100W or less tungsten lighting. It is also useful to subdue the red-yellow color cast when photographing in the early morning or late afternoon. There is a 1.5x filter factor with this filter, requiring an increase of 0.6 stop for normal exposure. It has a 28mm brass mounting ring that is painted a matte black to help reduce reflections. The SH-PMC multi-coated Schott glass provides greater contrast and reduced reflection compared to uncoated filters. 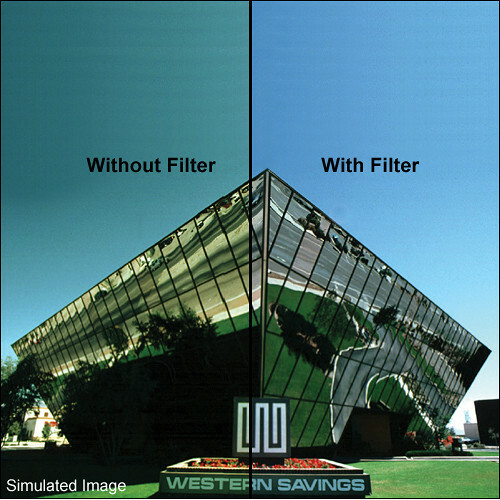 Color conversion filter helps to slightly increase color temperatures and provide a cooling effect. Removes the red-yellow light cast that commonly occurs in the morning and evening hours and also with 100W or less tungsten lighting. 28mm brass mounting ring that is painted a matte black to help reduce reflections. SH-PMC multi-coated Schott glass provides greater contrast and reduced reflection compared to uncoated filters.